Agostino Busti, known as Bambaia, was an important Lombard sculptor, notable for his refined technique and innovative classicism. First mentioned in 1512 in the workshop of Milan Cathedral, he created a number of major tomb and altar commissions, often in collaboration with other sculptors such as Cristoforo Lombardo. 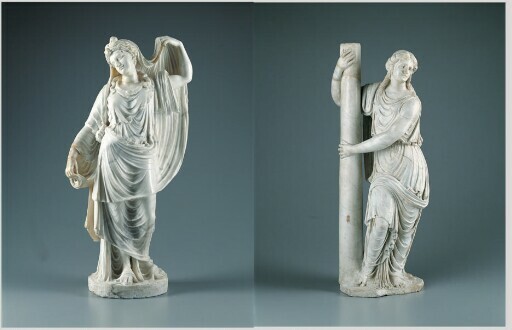 These two marble sculptures represent Virtues: one is identifiable as Fortitude by her attribute, the column; the other figure is without an attribute and may represent Hope. The exquisite sweep of the latter’s diaphanous drapery, with close pleats and rippling edges, exemplifies Bambaia’s virtuoso carving technique. Her pose derives from the ancient Venus Genetrix type, and the sweet and lyrical expression of the face was inspired by the work of Leonardo da Vinci, with whom Bambaia apparently traveled to Rome in 1513. The Virtues probably originally adorned a tomb monument that was later dismantled and dispersed. by inheritance to Bice Antona Traversi Tittoni, and her husband, Tommaso Antonio Tittoni, possibly dispersed around 1900-01.
purchased through (Matthiesen Fine Art Limited, London) by Kimbell Art Foundation, Fort Worth, 1981.